Trumpet Voluntary. The most well-known Wedding Processional music – ever? The Trumpet Voluntary must be one of the most performed pieces at Wedding Ceremonies all over the world and yet there is a lot of confusion as to its name, its origins and its composer. 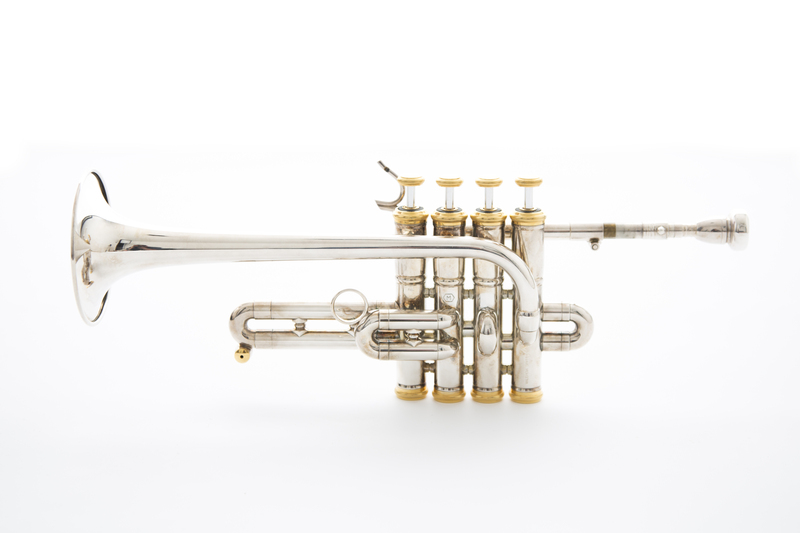 Firstly, it wasn’t originally written for the Trumpet, but as a March (or Processional) for the Organ and would have been performed using the Trumpet stop, to create a distinctive sound. It dates to around 1700 during the Baroque period. Secondly, it was originally attributed to English composer Henry Purcell, however this is also incorrect and was actually composed by his lesser-known compatriot, Jeremiah Clarke, who in his own right was an accomplished musician and was organist at St. Paul’s Cathedral in London. The next bit of confusion stems from the title of the work “Trumpet Voluntary”. This was a popular style of writing, therefore the title was often used and trumpet players even today have to be careful that people get to hear the correct Voluntary when asked, as there is also a very popular one by John Stanley (sometimes also referred to as Trumpet Tune). Just to keep people on their toes, the final bit of confusion lies with the fact that the piece has not one, but two recognised titles. “Trumpet Voluntary”, is also known as “The Prince of Denmark’s March”! Confused? Don’t blame you, but if you use the latter title, most competent and experienced musicians should know instantly which piece you are referring to! The sound clips above and below will hopefully help sort the confusion, but I’m sure you’ll agree both works are great pieces of music regardless. Probably the most famous Wedding to feature this music, was the Royal Wedding of 1981 when HRH Prince Charles married Lady Diana Spencer. It’s not just weddings though that have featured Clarke’s evergreen work. It has been used by an eclectic mix of musicians and performers, including the Beatles, Sting and Peter Sellers to name but a few. 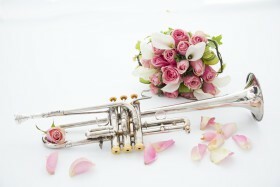 If you would like to make your “Big Day” extra-special and have Trumpet Voluntary performed at your Wedding Ceremony, then please call Andrew on 07973 869621 or e-mail me at andrew@andrewjonesmusic.com to discuss things further. Why, in the world of music, does mediocrity win over genuine talent and skill? Its been a while since I last wrote a blog, but I’ve been inspired to put cursor to screen having witnessed music-making of the very highest order this week. Both events were polar opposites, but the levels of skill and talent on display were never in question. First up was my brass band “Fest” watching the live streaming of the European Brass Band Championships from Oostende, where 12 of Europe’s finest (including the Cory and Tredegar Bands from Wales and Brighouse & Rastrick Band representing England) were vying for the coveted title. The 24 performances – each Band performed a set-work (Kevin Houben’s “Where Angles Fly”) plus an own-choice work – over the 2 days was quite frankly astounding. I’ve been privileged to have performed at the Europeans on 8 different occasions and the standard of playing since I first appeared in 1990 has risen year on year, to a point where you’d be hard-pressed to say that these weren’t professional ensembles. Wales once again were at the forefront come results time, with Cory (defending Champions) being placed third and Tredegar coming in fifth. 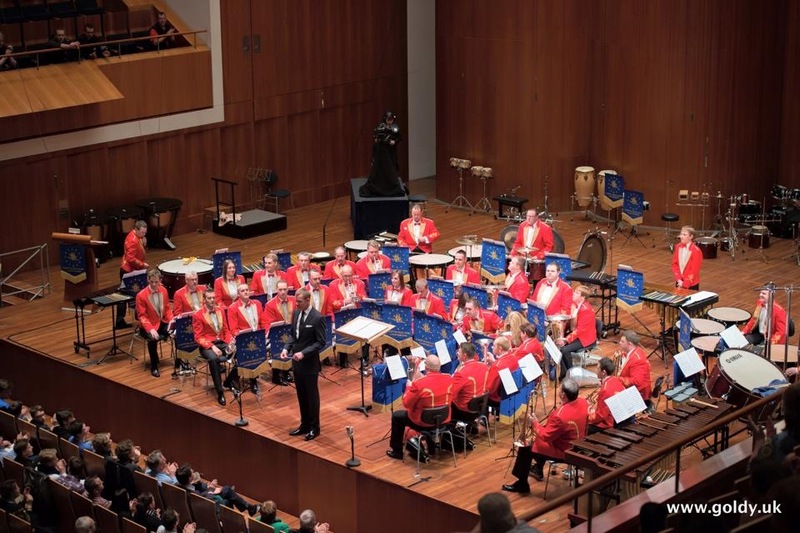 The winning Band this year were Eikanger-Bjorsvik from Norway, led by their inspirational conductor Ingar Heine Bergby, who won following a near 30 year gap since the last time they lifted the trophy. Their stunning own-choice performance of “Fraternity” by Thierry Deleruyelle will live long in the memory. Following the Europeans, my next source of inspiration was at Cardiff’s St. David’s Hall, where the wonderful, zany, jaw-dropping, breath-taking etc. etc. “gentlemen” of Mnozil Brass wowed the audience with the mastery of their art. Musicality, power of recall – playing everything from memory, humour, timing, stamina (where do they develop that staying power? ), diversity, subtlety and innuendo and so much more. A sheer joy to hear and watch, leaving the audience shell-shocked and spellbound in equal measure. Superlatives are often over-used, but each one I have used was hugely earned and justified. So, the point of today’s blog is, why do the general public get pawned off with rubbish on television and radio and the publicity given in column inches in the press/social media, when there is so much REAL talent out there? 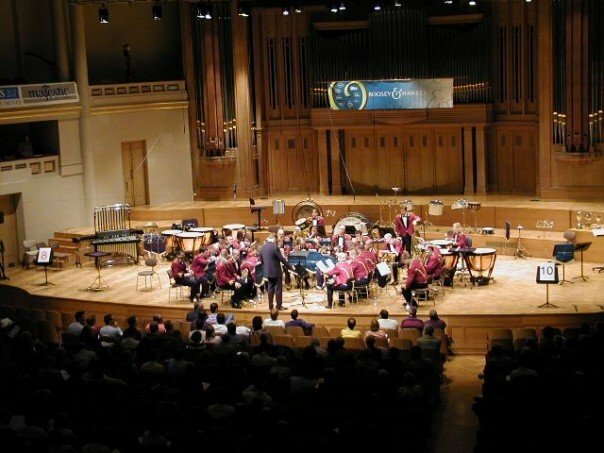 Admittedly, the European Brass Band Championships is very much a niche market, but when Cory Band last year (2016) won the “Grand Slam” of European, National, British Open and Brass in Concert titles (an amazing achievement), they barely made a mention in the local paper. Eikanger’s win at the Euro’s last weekend earned them a massive welcome reception at the airport on their return, with TV and media crews in attendance! Says a lot for what we think of our Champions doesn’t it? Mnozil however, is an ensemble that could easily be featured on mainstream TV, or at very least on one of the Arts-focused stations. But no, we are subjected to performing dogs or yet another 11-year-old bashing out a Celine Dion hit and being told she has “amazing talent” and will go far etc. etc. As “defenders of the faith”, perhaps we need to be more pro-active in demanding that the TV companies and media do cater for the more discerning audience and not settle for the rubbish that is often forced down our throats. A small ray of sunshine in this gloom of mine, was Cory’s invitation to appear on ITV’s ‘Tonight at the London Palladium’ programme hosted by entertainment star Bradley Walsh. Their performance was recorded live in front of a packed audience of 2,200 people and subsequently broadcast to an estimated audience of over 5 million people last night (03.05.17). Perhaps this is a significant step towards redressing the balance and highlighting the TRUE talent that can and should be presented to audiences the world over. 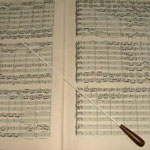 Selecting a programme for a Concert? The opportunities of hearing Brass Quintets in Concert are sadly rare, as most of our work nowadays is either for Weddings or for corporate events, so when Music for You were invited to perform for the Rhymney Valley Music Club, we jumped at the chance. The Concert (which is supported by the Night Out Scheme/Arts Council of Wales) takes place on Saturday 1st of April at Siloh Christian Community Centre, Oakfield Street, Ystrad Mynach, Caerphilly, CF82 7AF and starts at 7.15pm. Before we go any further, I’m in danger of assuming that everyone knows what a Brass Quintet is, so just in case, a Brass Quintet comprises of 2 Trumpets, French Horn, Trombone and a Tuba and this line-up has become the most popular for chamber brass ensembles over the years, as pioneered by the late great Philip Jones. He founded the Philip Jones Brass Ensemble and when they weren’t performing as a 10-piece ensemble, this was their smaller group and he was hugely influential in developing chamber music for brass instruments. So back to the Concert. Being the sole performers, the evening gives both the Quintet and members of the audience a chance to get their musical teeth into repertoire they would otherwise be unlikely to perform or hear, outside of a Concert setting. This in itself can cause problems however, as musicians often want to get stuck into some really challenging and high-brow repertoire that leaves all but the avid quintet connoisseur underwhelmed and unimpressed. On the flip-side, “dumbing down” a programme to contain a succession of light 3-minute “toe-tappers” or light classical items, means the audience are treated with contempt and the assumption that they couldn’t handle anything more serious than a John Philip Sousa march or maybe (if we were daring enough! ), Samuel Scheidt’s (Yes, that’s his real name!) “Battle Suite”. In compiling our programme for this particular event, we’ve tried to appease both appetites and hope that the audience will discover works by composers covering a 600 year period, that will be both enjoyable, stimulating and perhaps even educational. There will even be music from a living Welsh composer! The Art v Commerce approach of programming concerts, has and always will be a hot potato for musicians and marketing departments the world over. I’ve always been a strong advocate for introducing audiences to new repertoire and composers, by gently broadening their musical horizons and not metaphorically ramming it down their throats, with the underlying message of “here it is, YOU WILL like it …. or lump it!” or “if you haven’t heard this before, you should have!”. I very much hope, that we have succeeded in putting together a programme which is balanced for all tastes, but also gives us as performers, a rare opportunity to get our creative “juices” going a bit too. even the Brass Quintet aficionado will discover lots of new repertoire, so don’t expect the “same old, same old” programme! Without giving too much away, there will be works by Handel, Rimsky-Korsakov, Gordon Langford, Edvard Grieg and Koetsier to name but a few. So why not pop along and have a listen – it would be great to see you. Remember, there’s nothing quite like live music and even if there is something you want to watch on telly, you can always record it! Today (March 1st) is the National Day of Wales – St. David’s Day or Dydd Gwyl Dewi. To all my fellow Welsh compatriots “Dydd Gwyl Dewi hapus i chi gyd, ble bynnag yr ydych yn y byd!”. Happy St. David’s Day to you all, wherever you are in the world! (Picture – The Welsh Dragon Memorial is at Mametz Wood in France, erected to remember the lives lost of soldiers from the 38th Welsh Division during the Battle of the Somme). Mozart – pure genius or a freak? On this day (October 29th) in 1787, hours before the first performance of his opera “Don Giovanni” is to be given, Mozart is reminded that he is yet to write an Overture. He duly instructs his Wife to serve him punch and tell him fairy tales throughout the night, until the work is complete. “The ink was hardly dry on some of the pages when they were placed on the desks of the orchestra” – Wenzel Swoboda (Double-bassist in the orchestra). The National Youth Orchestra of Wales is 70 years old today. 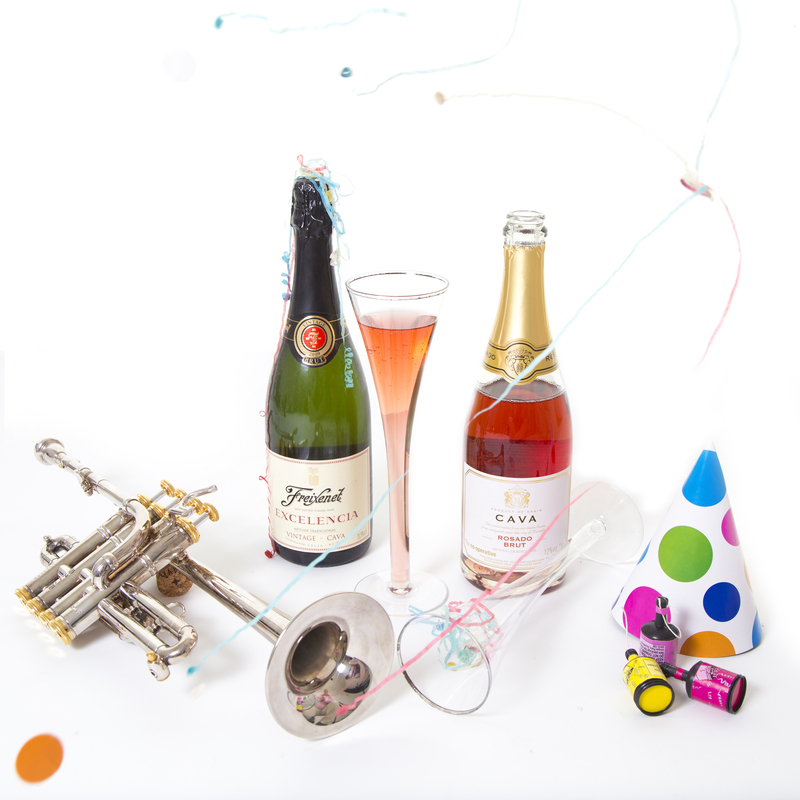 Happy Birthday to the oldest National Youth Orchestra in the world!!! Yes the National Youth Orchestra of Wales (affectionately known to its Alumni as “The Nash”) was formed 70 years ago today and since then, thousands of young musicians have come through its ranks and gone on to forge hugely successful careers in the music industry, both here and all over the world. Over the years, the orchestra has been led by such names as Clarence Raybould, (1945–1966), Arthur Davison (1967–1990), Elgar Howarth (1991–1995), Christopher Adey (1996–2002), and Owain Arwel Hughes OBE (2003-2010). 2011’s concert series was conducted by Takuo Yuasa. Carlo Rizzi (2012), Grant Llewellyn (2013), Jac Van Steen (2014) and Paul Daniel (2015). This year’s course, starting today in Lampeter University will be led by Carlo Rizzi, where the programme will include works by Gareth Wood (himself a former member of the Orchestra), Bartok and Richard Strauss. I was privileged to have been one of those lucky members back in the days when it was led by the inimitable Arthur Davison and I benefited from specialist tuition from trumpet legends such as John Wilbraham and Bob Walton. These were fantastic mentors and the tutoring, experiences and grounding I had during those courses were invaluable in helping me become who and what I am today. Long may the “Nash” continue for many, many more years and I urge you all to try to get to one of their Concerts if you can, but if you can’t here’s the Orchestra in action back in 1989. It just so happens that I was playing too! Happy Birthday/Pen-blwydd hapus to “The Nash”! Why have live music for your wedding? It seems that anyone getting married nowadays is on a quest to find something “different”, “unique” or “unforgettable”. So, when entrusted to perform at someone’s special day and with these ingredients in the mix, there’s just a hint of pressure, both from the Bride and Groom to be and self-imposed by me (as a musician and business owner) to deliver the goods. The Music for You Brass Quintet was recently booked to perform at Catherine and Ryan’s Wedding Ceremony and Drinks Reception. 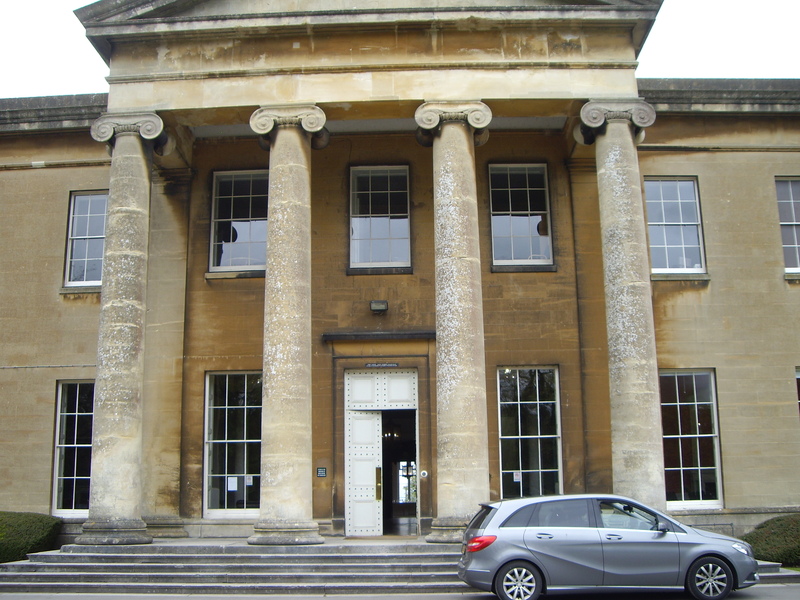 The venue was the majestic setting of Leigh Court in Bristol, where the acoustics lend themselves brilliantly to brass instruments. The brief was to play some music as the guests arrived for the Ceremony, then play the Processional Music for the Bride (and stunning she looked too! ), as she entered to the elegant sounds of Handel’s Air from the Water Music. Music by Gershwin and the Carpenters followed for the signing of the Register, with the rousing sounds of Indiana Jones and the Temple of Doom heralding the newly married couple out for the Recessional music. Once the formal part of the day was over, we then entertained the guests during the Drinks Reception, with an eclectic mix of repertoire, ranging from light classics, to songs from the shows, operatic arias, pop songs and music from the silver screen. During this session, whilst seated just outside the main Reception room, we were asked to move twice. “Too loud” I hear you thinking!!! Not in the slightest – in fact, we were asked to move closer each time, because the guests were gently moaning that they couldn’t hear us and wanted to enjoy the music. Unfortunately, I was unable to grab a quick word with the Bridal couple before they and their guests departed for the Wedding Breakfast, so was unable to congratulate them personally and get some brief feedback and check that they were happy with our contribution to their special day. I naturally sent a thank you e-mail the following day and asked if they’d be kind enough to share their thoughts on our musical contribution. In the age where, if someone doesn’t reply to a text, e-mail or voicemail within a maximum of 15 minutes (perhaps less if you’re of a certain generation!) then something’s seriously wrong!!!!!! You go through the terrible “OMG, they hated it”, “We played their most hated piece of music”, “We looked dreadful” etc. You know that they have got stacks on their plates, even after the Wedding’s all done and dusted and they’ve probably gone on honeymoon, but you’re still on pins wanting to know whether they were happy! Needless to say, I was heady mix of relieved, ecstatic, proud of the efforts of my fellow musicians and reassured that Music for You is capable of providing its clients with “something different, unique and unforgettable”! 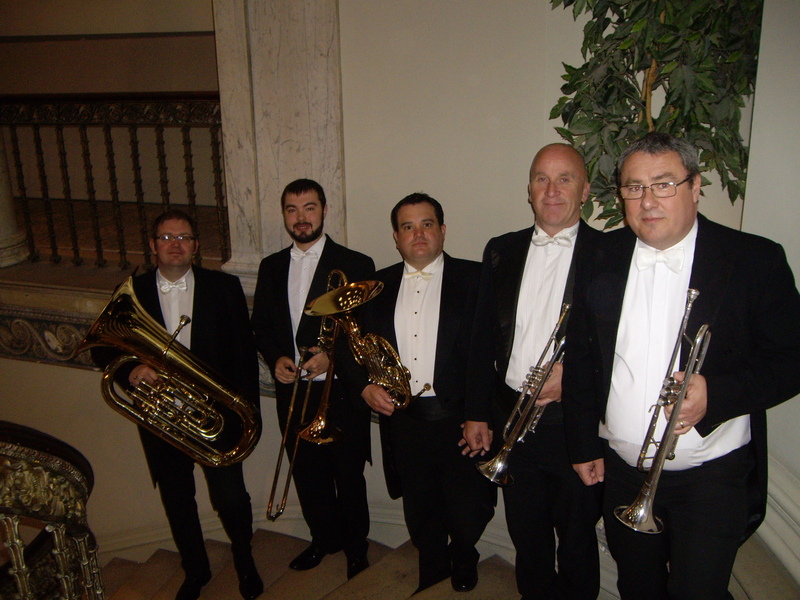 For more information about Wedding Music visit our web-site and to hear the Brass Quintet in action you might like to go to our You Tube page for some ideas. Photograph by Paul Fears Photography. I’m currently updating the page, so if some stuff looks a little “confused”, it’s because I am too! Normal service will resume very soon – I hope! A big shout-out is due to Paul Fears for his input and expertise regarding the “new look” and for encouraging me to be myself. Thanks for your patience and I hope you enjoy reading the Blogs and the new look for the site. What’s that funny looking thing sticking out of the end of your trumpet? I was at Llys Prês, a Cardiff-based instrument repair workshop the other day, and found myself taking a keen interest in the wide variety of tools that Denis Wedgewood had at his disposal. He patiently answered all my innocent (perhaps naïve) questions as to why that was a certain size or this was a particular shape and why he needed 3 or 4 very similar looking tools to complete a certain job, however I left the premises with no more skill; these things come under the heading of D.I.Y. – Don’t Involve Yourself, but certainly far more informed and enlightened as a result. This then made me think about my own job and the tools that I have to use and I remembered Mrs. Wife asking me similar questions about playing the trumpet. One such question was regarding the “funny things you stick in the end of your trumpet” and what was the point of it all, so this has prompted me to explain a little to those of you who don’t know either. These “things” are actually called mutes and their function is to change the tone and sound of the instrument, so as to create a variety of effects, moods and timbres to the music. There are a multitude of mutes available on the market nowadays, with manufacturers constantly striving to develop unique, newer or improved products, so in the Blog I will cover the main mutes used by most trumpet players, however there will be many that I have left out due to the myriad out there. 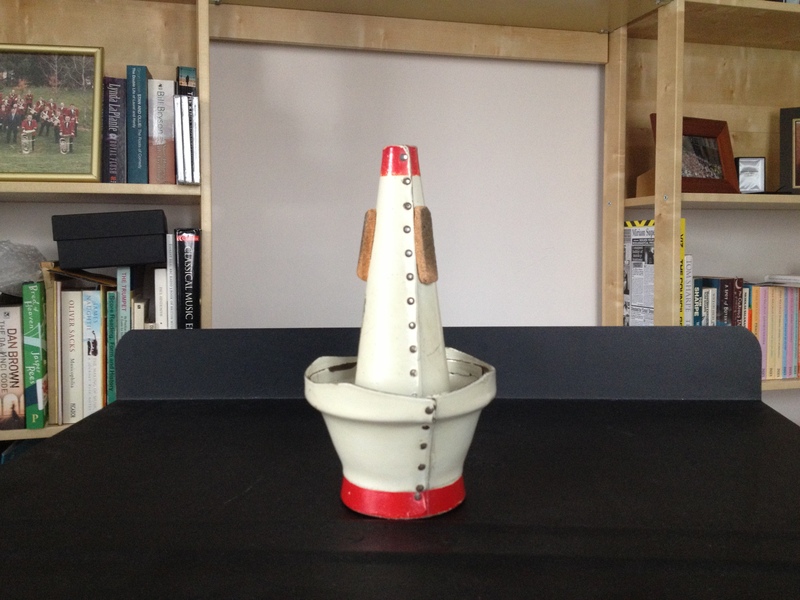 The Straight mute – This is the most commonly used by players, but there are variations even for this type, as they can be made of metal, wood, fibre and plastic and have distinctly different sounds. 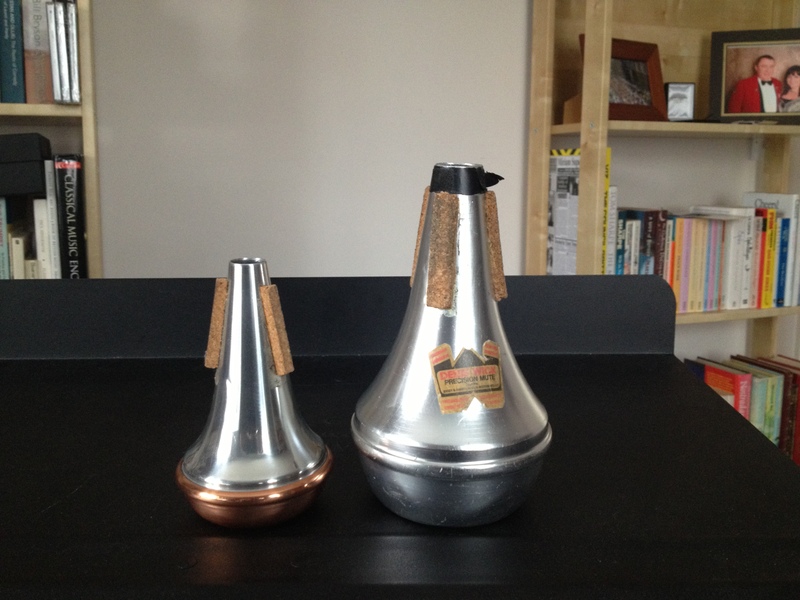 Straight Mutes (Metal) – The mute on the left is for a PiccoloTrumpet and the one on the right is a standard sized one. 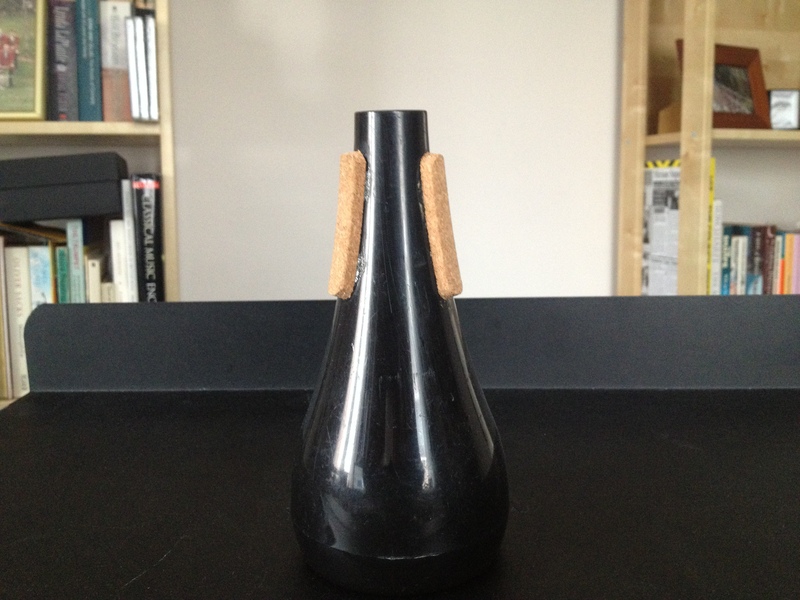 The Cup mute – This as its name suggests, has a cup shape and makes the sound much mellower and softer. 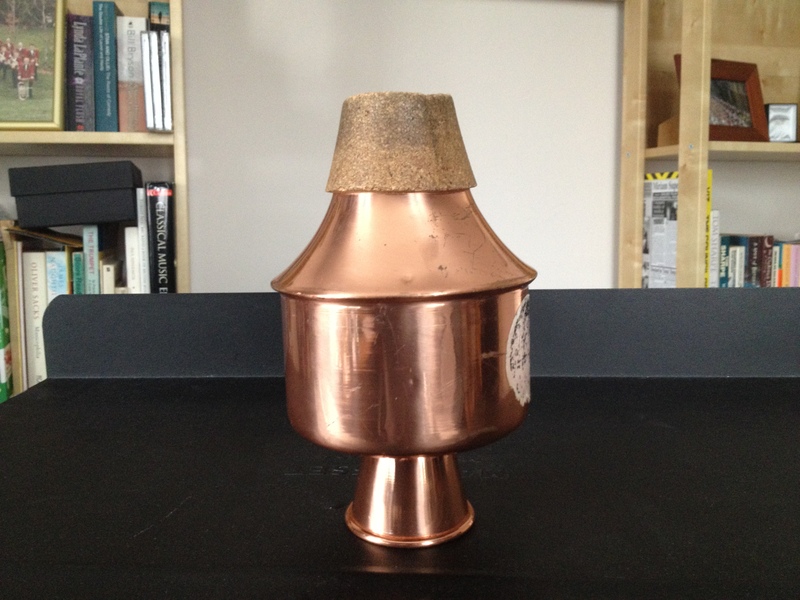 Some cup mutes have a moveable cup that slides closer to, or away from the bell of the trumpet, in order to change the tone slightly. 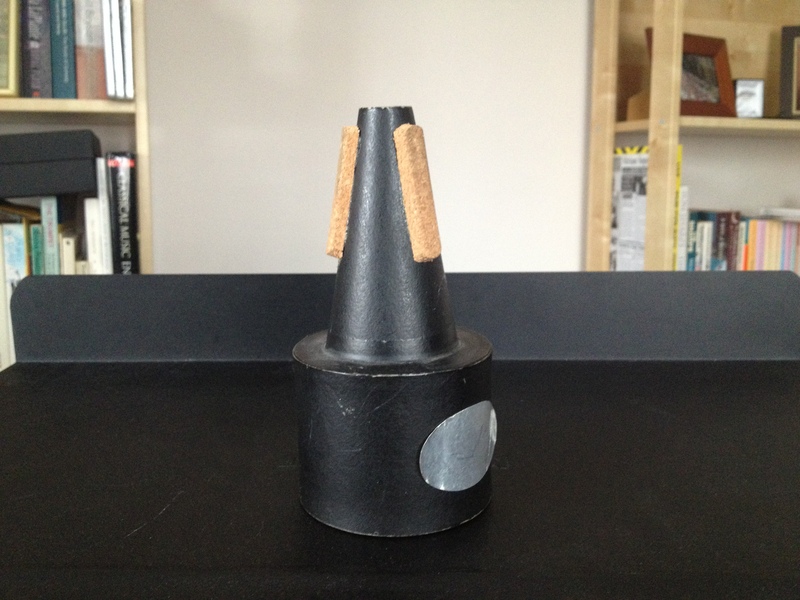 The Harmon mute – The Harmon mute is another mute where the tone can be altered, using a movable stem. 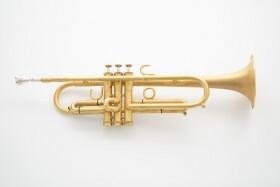 The general tone is quite “nasal” and constricted and this is often used to portray a trumpet playing distantly. The further out you pull the stem, the darker the tone gets until you can actually remove it completely. 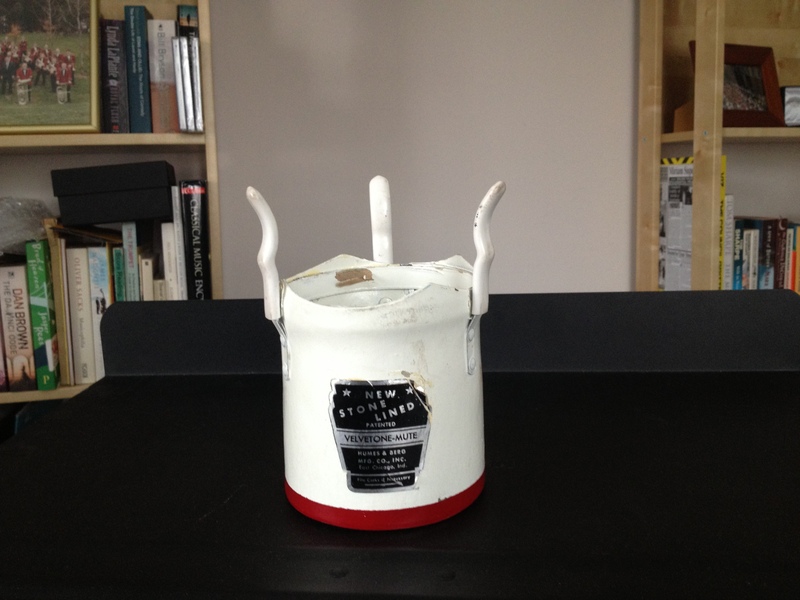 The Bucket Mute – This clips on to the bell of the instrument and is lined with a soft padding. This absorbs most of the brightness of tone, making the music sound muffled. 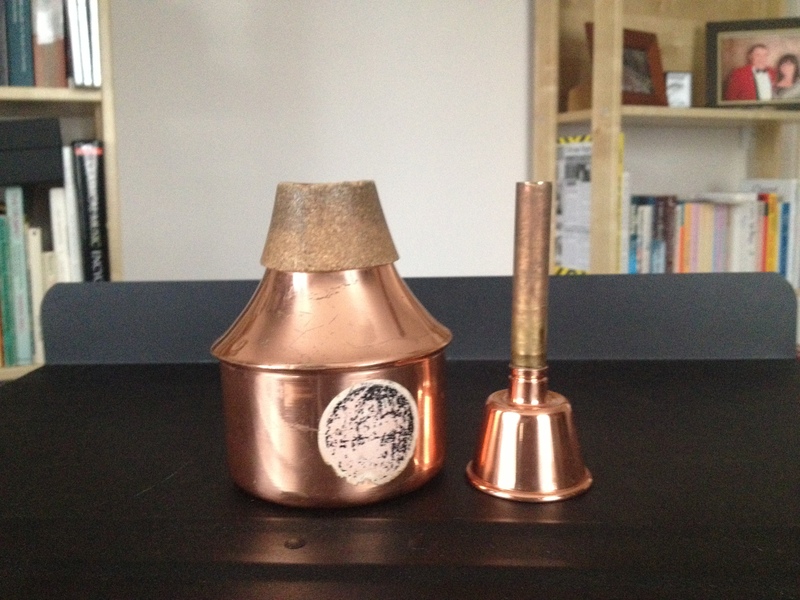 There are many more mutes, as I have already mentioned; such as the Plunger mute, the Solo-tone and a Practise Mute (designed to keep your neighbours happy when you start ripping through the Haydn Trumpet Concerto at 2.30 in the morning! ), but I hope that this gives you an insight to these “things”, commonly known as mutes.